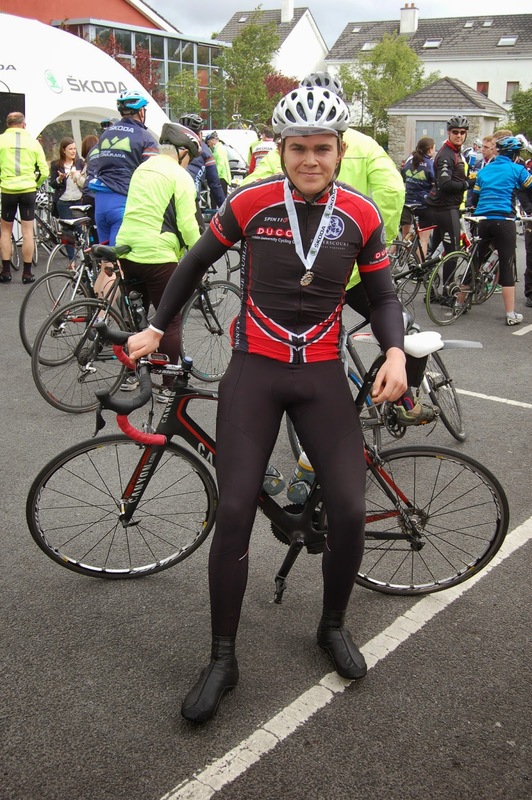 The Tour de Connemara was my first significant ride since my exam period started, back at the start of April. Because of the exams I wasn’t sure how I would perform due to the 7 weeks of stress, lack of exercise, and Centra chicken fillet rolls that accompany 10 Engineering exams in your final year. I had tried to fit in some rides, but they were short and not very intense. This led to some apprehension about the ride! I had signed up to the Tour de Connemara more from a nostalgic point of view as the route went though many areas I had spent my childhood summers in. For the first 16 years of my life, I had spent some period of my summers caravanning in Acton’s campsite on the coast in Claddaghduff, around a 20-minute drive from Clifden, so I knew almost every part of the route from excursions during these summers. My Mum and Dad also came down for the Tour as they too had spent summers in the Connemara and enjoyed spending time in the West. The Tour isn’t a competitive race like the ones I’ve been blogging about, but a sportive. A sportive involves a mass start before following a route which has numerous food stops where people can stop and refuel before continuing on, at whatever pace suits them with no time limits to be made. 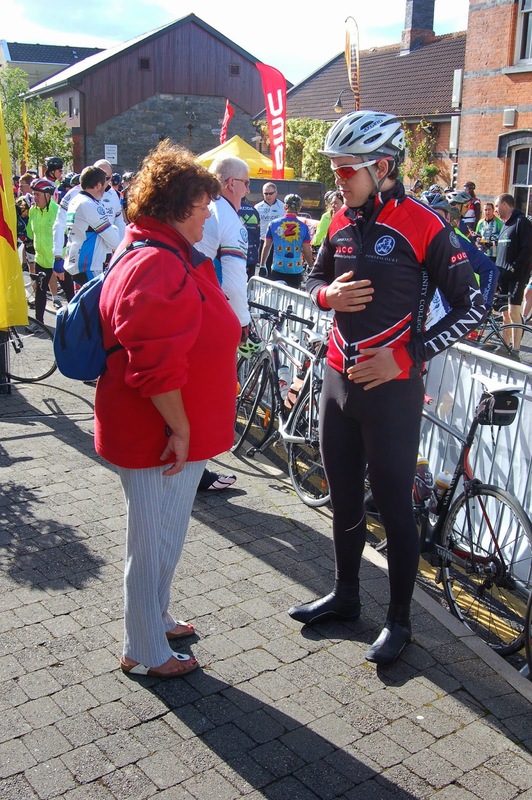 I’ve done many sportives and find them a great way to explore a country, meet new people and developing endurance. 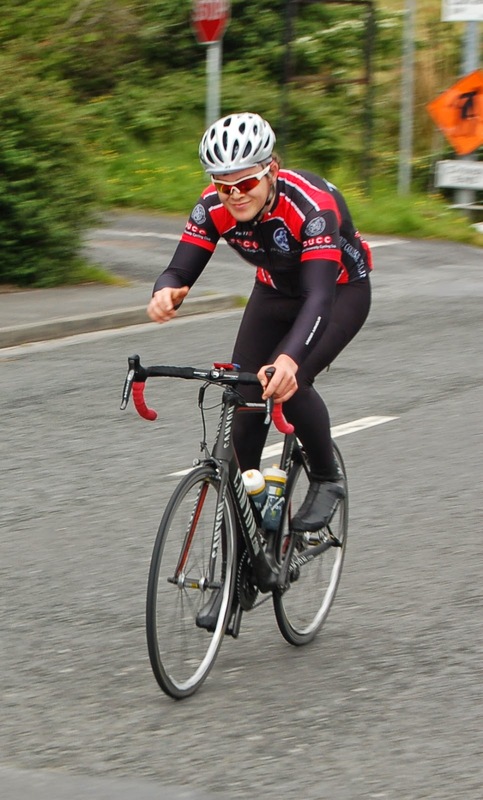 For this particular sportive though, I decided to really go for it and try and finish in the front group. I wanted to do this because my fitness needed a good shock to get it back in gear after such a long exam period. My parents and I had headed out to Connemara the day before the race so we could spend a day setting up the tents in Acton’s campsite and wondering around Claddaghduff. This included a bone-numbing swim (which my Mum and I regretted immediately! ), walking along the coast to Sweeney’s pub for a pint, making friends with a cow and enjoying cold pasta bolognaise on the point of Omey Island in the freezing wind! While all this doesn’t sound like a pleasant way to spend an evening, I thoroughly appreciated it as it brought back great memories. After our fun evening we returned to tents for the night which, given the blowing wind, was not very enjoyable. But nonetheless, I was eager for the next day to begin and to get cycling. The next morning came after a restless windy night in the tents but the sun was shining which was a change from last year, where it was incredibly wet and cold. Now it was just cold and windy but most importantly, dry! We had our breakfast, which consisted of a very sophisticated cereal and milk given our setup, before heading off to the race. I had decided to wrap up warm because of the cold wind and if necessary change when I got to the start if the conditions changed. Mum and Dad decided to break down camp after I had started off, which was great for me, as I didn’t have to do it! They would then try and meet me at various points on the route to snap a few photos and cheer me on. The joys of camping and cycling! One last look before getting down to business! We arrived at the Station House in Clifden where the race was starting. The buzz in the start area was fantastic and everyone there was chatty and friendly. Another great thing about sportives is how easily they can be accessed. At competitive races, everyone is lean and mean, and looking at you with an eye of competition, thinking how to get one up on you. 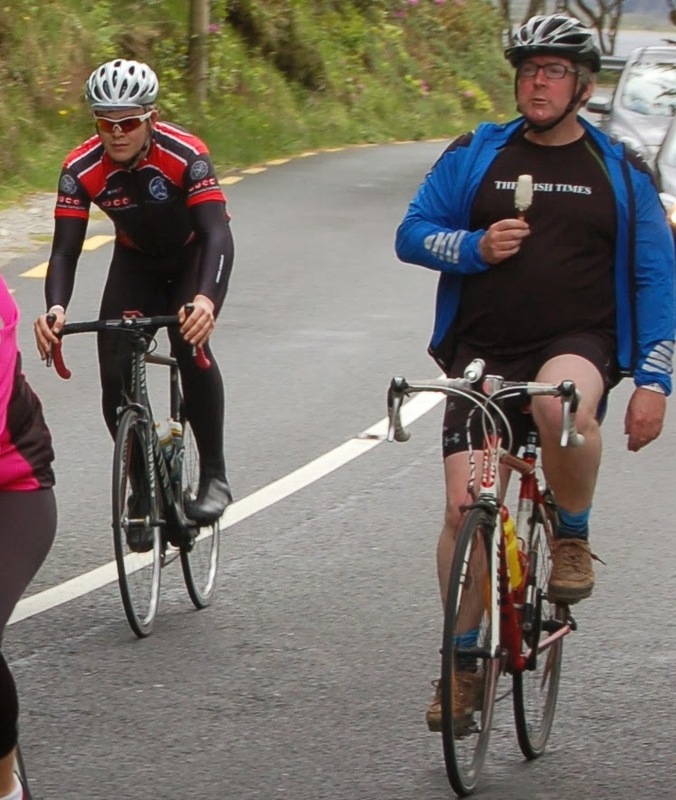 At sportives, all shapes and sizes are participating, everyone is a friend, and we’re all there for one purpose, to enjoy cycling in the mesmerising scenery of Connemara. Competition has its place and I relish it, but sometimes just enjoying cycling is so simplistically fun. The route today was a lumpy 140km anticlockwise loop of Connemara starting in Clifden. We would head down to Roundstone, across to Cashel, up to Maam’s Cross, over Maam Valley, across to Leelaun, along Killary Harbour, pass Kylemore Abbey and finally though Letterfrack before finishing in Clifden. While there were no significant climbs on the route, there were numerous short sharp climbs, but given momentum, could be easily handled. Nothing my large frame couldn’t handle! The wind on the day would be quite significant though. A strong Northerly wind would affect us for a large proportion of the course. Theoretically, since we were cycling in a loop, for all the headwind we’ll have, we should have the same amount of tailwind, but as all cyclists know, it doesn’t quite work out like that! After signing in (and receiving a lovely training jacket), I got my gear ready and soon I was standing in the start area waiting for the Grand Départe! As we got closer to the start time, the buzz intensified. Even the inflatable Skoda sign collapsing didn’t dampen spirits, if anything we all got a laugh out of it! After it had been reflated, we were signaled to start. I had wormed my way to the front of the start area, as I knew the fast front group would form quickly and I wanted to be in it. As we rolled out of Clifden, I could see a few riders shooting off at a very fast pace, including Aidan Reade in his Irish National Champion gear. I was apprehensive to jump onto them as they were going very quick, very early and I felt I needed time to warm up. If I pushed too hard too early, I was sure I’d pay for it later on, especially as I hadn’t done a long spin for nearly two months. So I played it cool and waited for someone a little less fast. After around 3km, a Killarny rider passed me going at a decent pace so I decided to latch on and we eventually caught the fast riders who had shot off but had since slowed down slightly. So 6 of us formed a nice group that worked well together each taking our turn on the front before someone else coming through. It was obvious that everyone had some racing experience, as it was all very smooth. 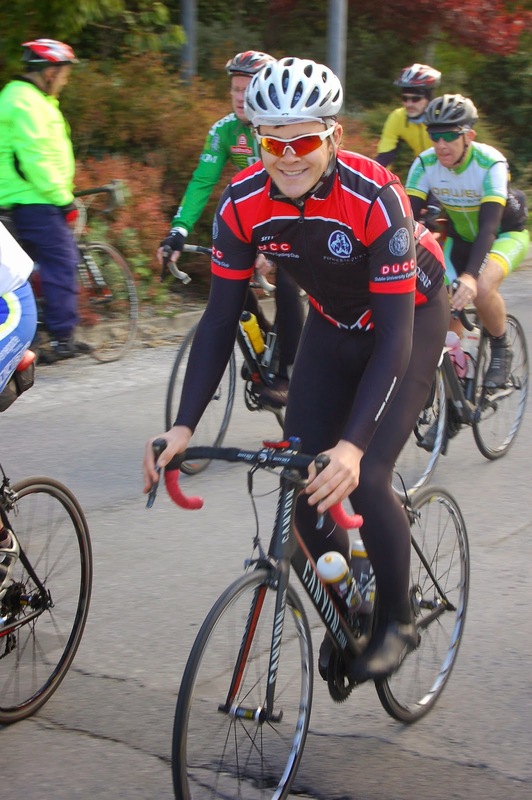 One of the riders was a guy called Chris training for the Wild Atlantic Way Challenge. Chris had a great and chirpy character and was cranking out the jokes that were a great was to pass the time. I learnt that Chris and group of people were using the Tour de Connemara as a training spin to get ready for the Challenge, which included old rugby legends. So the 6 of us continued to ride along till we hit Roundstone where we received a warm welcome of applause from the residents, it made me feel like quite the pro! Soon after, we were joined by a very large group of around 30 riders who had caught up with us. This was good as there were now more riders to share the load of riding on the front into the significant headwind we had from Cashel up to Maam’s Cross. Everyone in the group decided to skip the first food stop, which came after 40km, which suited me, as I was feeling good and fresh. Until Maam’s Cross nothing particularly exciting happened, a few riders seemed to be quite excited and every time they came through, the pace would shoot up, but a few shouts from the wiser riders calmed them down. Coming up to Maam’s Cross the head wind became particularly strong which cut down our pace. After crossing Maam’s Cross, we had to work our way up the valley that led to Maam Village and the second food stop of the day. The climb was the only significant one of the day so I knew I could go reasonably hard on it and not worry too much. Coming up the foot I found myself coming to the front of the lead group to do my turn. I pulled off thinking the next rider would come through to do his turn, but no one came through! I probably should have slowed down to let someone come through but I was happy to be leading the group up the climb so I set the pace up. Coming up to the top, a young rider from the Nicolas Roche Performance Team jumped away and sprinted to the finish. I presume he had been using the sportive as a training ride and was putting in a decent effort as he soon slowed down after cresting the top. Coming across the top I asked around if we were stopping at the next food stop, which came at the bottom of the descent we were starting, and the general consensus was that we were which I was happy about as I was running low on fluids and bursting for the toilet! After the fun descent, we pulled into the food stop were I proceeded to rush to the toilet, then fill up my bidons. I looked around and saw everyone was sitting down and getting comfortable with some tea and cakes! I was hoping that people would get going pretty quickly after stocking up and relieving bladders, but it didn’t look like it. I saw Chris getting ready to ride and he said that he couldn’t stop for long as he seizes up if he does. I asked if I could ride with him and of course he had no problem with that. His friend Mike, who was also training for the Challenge, joined us as well. We thought that if we took it easy enough the front group would eventually catch up with us and we’d join up with them. So off we went. The section we had just started down to Leelaun was again into a severe head wind being funneled down the valley. While we weren't racing along, we weren't taking it too easy either. We were joined by another rider, which helped with the load sharing. There was some spectacular scenery along this valley with mountains pushing up on each side of us. We eventually started the short descent into Leelaun before riding along Killary Habour for a few kilometers. The views along Killary Harbour were once again stunning and beautiful. Our pace continued to increase along the Harbour until we were almost at full pace again, so much for waiting for the fast group to catch us! Coming to the end of Killary Harbour, we had to do a little climb to get out of the Harbour were Mike and the other rider proceeded to drop Chris and myself. Coming over the top I managed to crawl back onto Mike and the other rider with Chris also eventually getting back on. The next section was reasonably flat as we rode beside Kylemore Lough, we also had a tail wind which helped a lot. At this stage we had joined up with the 80km route so we were no longer the only cyclists on the road. As we reached Kylemore Abbey my Mum and Dad were cheering at the side of the road. My Dad snapped a few pictures and unintentionally snapped a hilarious photo of a rider cycling along eating a choc-ice! Which was well received on the Facebook event page! We decided to skip the last food stop at Kylemore Abbey as we were only 20km from the end and flying. At this stage we lost Chris and our mystery rider, Chris saying his legs had turned to jelly! So Mike and myself continued to push on and I really had to dig deep to keep up with Mike, especially on the numerous little climbs we had to deal with where he was very strong. With 8km to go, I cracked and couldn’t hold Mike’s wheel anymore. So off Mike cycled into the distance, as I withdrew into the pain cave and worked my way to the end of the course. The last few kilometers were rather enjoyable because as you get closer to the end you get a little bit of extra energy to keep you going! My parents eventually past me telling me to hurry up, which wasn’t well received by me! They went up the road and stopped to take a few more photos just before I came into the finish of the course. Rolling into the finishing area was great as all the cars were stopped so that I could roll without having to stop, again making you feel very pro! Upon crossing the line, I received a little participation medal, which was nice, and was given a well needed sports drink. My parents followed me in to congratulate me and take a few more pictures in the finish area. I thanked Mike for the ride and Chris rolled in soon after us and I thanked him as well before heading back to the car and clean up for the trip home. Overall, I really enjoyed my day at the Tour de Connemara. While it wasn’t competitive, I was very chuffed to be the second person to finish the 140km route, after Mike. It gave me some confidence about my fitness before my return to racing. Hopefully it won’t be too hard for me to regain my race fitness. The general consensus was that it was a great and fun day out. The event itself was very well organised, with rolling road closures, well-stocked food stations and friendly staff. The rain managed to hold off all day, which was great as well. I’ll certainly be back next year! I big thank you to my parents, Peter and Wendy, for all their work and support over the weekend. Great work Mark...it's a wonderful part of the world!